7 Days is a weekly round-up of the Editors' picks of what's been happening in the world of technology - written with a dash of humor, a hint of exasperation, and an endless supply of (Irish) coffee. It’s been another action-packed week in the world of technology, with almost no end of exciting announcements, intriguing rumors and new products grabbing our attention. 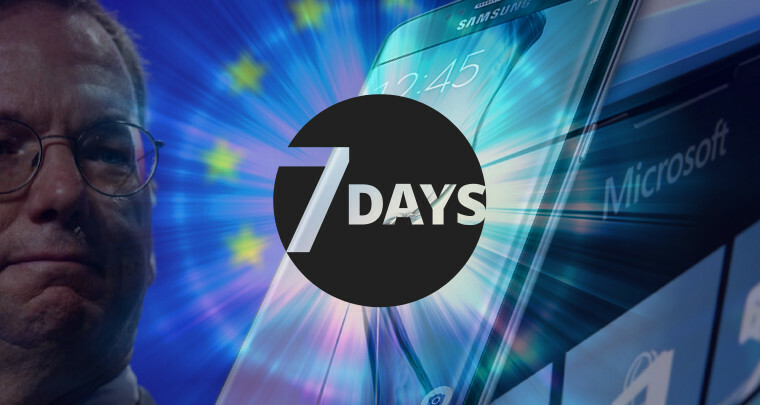 As ever, 7 Days is here to guide you through the week’s top tech news – and this time around, we begin our journey in Europe. The European Commission launched an investigation into Google this week, over concerns that the firm may have engaged in anti-competitive practices with its Android OS, and bundling and promotion of its own apps, services and search results on the platform. Google has been given ten weeks to address the concerns raised by the Commission, which could potentially expand the scope of its investigation further if it’s not satisfied with the company’s response. Still, while Google hasn’t had the best of weeks, things have been going much better for Samsung, which revealed on Wednesday that demand for its new Android flagships has been “much higher” than the company expected. That’s a two-edged sword, of course – while Samsung is no doubt rejoicing at the huge demand for the new handsets, global supply constraints could force interested buyers to look elsewhere. If you’re considering buy a Galaxy S6 or S6 edge, you may be interested to read that Samsung has confirmed how much it will cost to replace the non-removable battery in either device, as well as the price of getting a damaged screen replaced. And if you’re eyeing up the Galaxy S6 edge in particular, be sure to check out our unboxing and first impressions of the device, ahead of our full review in the coming weeks. But one device that LG has been keeping under wraps marks its return to Windows Phone, years after the company ditched the platform to focus on its Android range. Microsoft confirmed over a year ago that LG was coming back to Windows Phone – but we’re still waiting for that to actually happen. In fact, we got so bored of waiting for the company to do its thing that on Wednesday, we exclusively revealed LG’s new Windows Phone for Verizon. While we don’t yet know details of specs, pricing or availability, one thing’s for sure: it looks pretty dull. Unbelievably, Microsoft announced yet another lower-end Lumia handset this week – its sixth this year, after the Lumia 430 Dual SIM, Lumia 435, Lumia 532, Lumia 640 and Lumia 640 XL. The new Lumia 540 Dual SIM features a 5-inch 720p display, quad-core Snapdragon 200 processor, 1GB RAM, 8GB of onbo—oh, whatever. It’s another cheap Lumia with specs that are virtually identical to a bunch of other cheap Lumias. Seriously, it’s hard to stay interested when Microsoft is flooding the affordable end of the market with so many similar handsets. But you may be a bit more excited about the prospect of a new HTC handset running Windows 10. HTC’s chief financial officer said this week that the company has been ‘working closely’ with Microsoft on its first Windows 10 phone, promising to reveal further details by early Q3 2015. But we’re still a few months away from Windows 10’s launch – and until then, the next-gen OS remains in development, and in the hands of millions of testers on the Windows Insider program. The latest version for phones, build 10051, was released last week – but this week, Microsoft withdrew availability of the preview for three of its Lumia handsets, following reports that devices were being ‘bricked’ when attempting to roll back to Windows Phone 8.1. The company has since updated its Windows Phone Recovery Tool to help users to get their bricked handsets working again. And if you’ve been using preview build 10051 on your phone, but you’ve found that your handset crashes when you try to enter the SIM PIN, we published some workarounds that should help you to deal with that problem. By the way, we’d love to hear about your impressions of the latest Windows 10 Technical Preview for phones so far. Be sure to jump into our latest discussion, and have your say. One disappointment in the latest phone preview was that Microsoft removed the Office Hub, and with it, the ability to run Office apps on your phone in build 10051. But on Friday, Microsoft announced that it will release early versions of its new Office Universal Apps for Windows 10 phones by the end of this month – and we may even see a new OS preview build in the next couple of weeks too. Speaking of Office, Microsoft rolled out a major update for its Office 2016 for Mac Preview this week, introducing a range of new features and improvements. And if you're not familiar with Office Delve, it's a tool that autonomously surfaces useful and relevant information to help Office 365 business users to be more productive, and this week, Microsoft rolled it out to users on iOS and Android. Unfortunately, like most of the world, even Microsoft doesn’t bother developing for its own platforms first anymore; a Delve app is coming to Windows devices at some point, but the company hasn’t said when. On Thursday, Microsoft revealed more on the new virtual desktops feature in Windows 10, including details of its design approach, and a request for more feedback from those who have been using the feature in preview builds of the OS. So far, Microsoft has released previews of Windows 10 for desktops and notebooks, and for phones – but the story of how the new OS will run on small tablets hasn’t yet been told in any great detail. We know that Windows 10 on these devices will be less like the experience on desktop PCs, and more closely related to the phone UX – and this became even more apparent in images that leaked this week of an early build of the OS for small tablets. By the way, if you have an opinion on the new design direction that Microsoft is taking with Windows 10 – moving away from its Modern design language, and closer to user interface ‘norms’ that have become popular in other operating systems – be sure to vote in our latest poll! Meanwhile, Microsoft opened free registration for those wishing to attend the upcoming developer summit for its next-gen web browser, currently known as Project Spartan. The event will be held more or less on Google’s doorstep, in Mountain View, California, on May 5 and 6. From Project Spartan to Spartan Strike (see what we did there?)... Microsoft released a Halo title on a rival platform for the first time this week, making the latest game in the series available not just on Windows and Windows Phone, but also on iOS. The company also brought the earlier Halo: Spartan Assault to iOS this week, after it was first released on Windows and Windows Phone in July 2013, before later heading to the Xbox 360 and Xbox One. Microsoft released the May Update for Xbox One owners signed up to the company’s preview program this week, and it appears that it may be preparing to bring a rather exciting new feature to the console: the ability to stream games to other devices. This feature was first showcased back in January, but it looks like Microsoft is now getting ready to roll it out. Microsoft prepared a rather nice treat for Xbox Live users earlier this week, allowing them to stream the first episode of the latest season of Game of Thrones free on their consoles. Unfortunately, that lovely little freebie was slightly undermined by the leak of the first four episodes of season 5 online – so you may have to steer clear of any spoilers over the next few weeks. Over in the UK, Microsoft cut £30 off the price of its Xbox One console, which is now available from £299.99. However, there is some ambiguity over whether or not the price cut is permanent, as Microsoft’s Graeme Boyd referred to it as a “UK only retail promotion”, potentially indicating that it may be more temporary than it first appears. Also in the UK, Microsoft’s Band got its first international launch there this week, and is now officially on sale for £169.99, via many leading UK retailers. After a long, long wait, Grand Theft Auto V finally made its way to the PC this week, including a new feature exclusively available for those playing the PC version of the game. Rockstar Editor allows players to easily record and edit in-game footage, and upload it to YouTube. Unfortunately, the launch of GTA V on the PC wasn’t entirely trouble-free, and many users reported problems installing or playing the game on Windows user accounts containing certain characters. When Windows XP finally reached the end of the road last year, Google committed to support Chrome on the defunct OS until ‘at least’ April 2015. This week, the company announced that it is extending support for its browser on XP until the end of the year. That’s good news for those users still on Windows XP – but of course, it’s one less reason for them to bother upgrading. Even so, Google still advises users “update to a supported, secure operating system” without delay. We took a closer look at HP’s EliteBook Folio 1020 this week, a Windows 8.1 notebook which features a rather nice Quad HD display and aluminum bodywork. Check out our first impressions of the device, ahead of our full review in the weeks ahead. One of the more unusual Windows devices to appear in recent years was the Panasonic Toughpad 4K, a monstrous tablet with a 20-inch 4K display. This week, the company announced updated versions of the device, featuring Broadwell-generation Intel Core i5 and i7 vPro processors, up to 16GB RAM, 256GB SSD and plenty more. With prices starting at $2,999, the new Toughbook 4K isn’t cheap – but it is rugged, and it’s still half the price of the first-generation model. Quad HD displays are becoming increasingly commonplace in flagship-class handsets – but some manufacturers are already preparing for smartphones with even higher-resolution panels. It emerged this week that Sharp has developed a 5.5-inch display with 4K (3840x2160px) resolution; that equates to an astonishing 806ppi pixel density. To put that figure into context, the 5.5-inch Quad HD display on the LG G3 offers ‘only’ 534ppi. It’s hard to understand what the point of such a small ultra-high-resolution display would be, given that it’s already near-impossible to see individual pixels on similarly sized Quad HD screens. Indeed, many manufacturers continue to rely on Full HD displays for their flagships, including Huawei, which last year said that even Quad HD screens on phones are "a stupid thing". It was no great surprise, then, when Huawei unveiled its new Ascend P8 and P8max, both featuring 1080p displays. Both devices are incredibly thin – including the larger P8max, which is just 6.8mm-thick, despite featuring a huge 6.8-inch screen. Make sure you check out our hands-on first impressions of the Ascend P8 and Ascend P8max at their launch. After many weeks of speculation that it might be preparing to ditch its search partnership with Microsoft, which began in 2009, Yahoo announced this week that it has finally renewed its agreement with MS. The terms of the partnership have changed slightly, but Yahoo will continue to serve up Bing search results and ads “for a majority of its desktop search traffic”. Meanwhile, Bing has been going from strength to strength in the US desktop search market, and the latest figures reveal that it now has over 20% of that market. If you add Yahoo’s 12.7% share to the mix, the effective reach of Microsoft’s search platform comes to 32.8% - almost a third of US desktop searches. On Wednesday, Nokia announced that it is buying French network and telecommunications giant Alcatel-Lucent, in a deal worth $16.6bn, subject to regulatory approval. The deal may be partly financed by a sale of Nokia’s HERE Maps platform, developed from its $8.1bn acquisition of Navteq in 2008. However, the company is unlikely to get anywhere near that much if it sells now – Nokia’s own figures value HERE at around €2.1bn EUR (around $2.27bn USD at current exchange rates). All this talk of deals presents the perfect opportunity to mention the new Neowin Deals store, which we launched earlier this week. The store is packed with exciting deals and offers on everything from gadgets and gear to software, web services and games. And as a special sweetener for our awesome readers, we’re giving you an extra 10% off any purchase between now and April 30! And that’s not all. To mark the launch of the Neowin Deals store, we’re giving away a brand spanking new Google Chromebook Pixel, worth $1000! The device features a 12.85-inch touchscreen, 8GB RAM, USB Type-C connector and up to 12 hours of battery life. It’s easy to enter, so don’t miss your chance to win – and be on the lookout for even more giveaways in the weeks ahead! Our journey through the week’s top tech news ends with the news that a guy who played Candy Crush almost non-stop for at least six weeks somehow managed to tear a tendon in his thumb (normally an excruciatingly painful injury) without even noticing. Medical researchers believe this is an example of playing video games ‘interfering with when we feel pain’, and in a report published in the Journal of the American Medical Association, doctors have recommended further research into the ‘pain numbing’ powers of gameplay. But the last word on all of this goes to one of our readers: “Even more disturbing, a 29 year old man is playing Candy Crush and has absolutely nothing to do for 6 weeks.” Can’t argue with that. Read the full 7 Days roundup here. These articles are brought to you in partnership with Neowin.